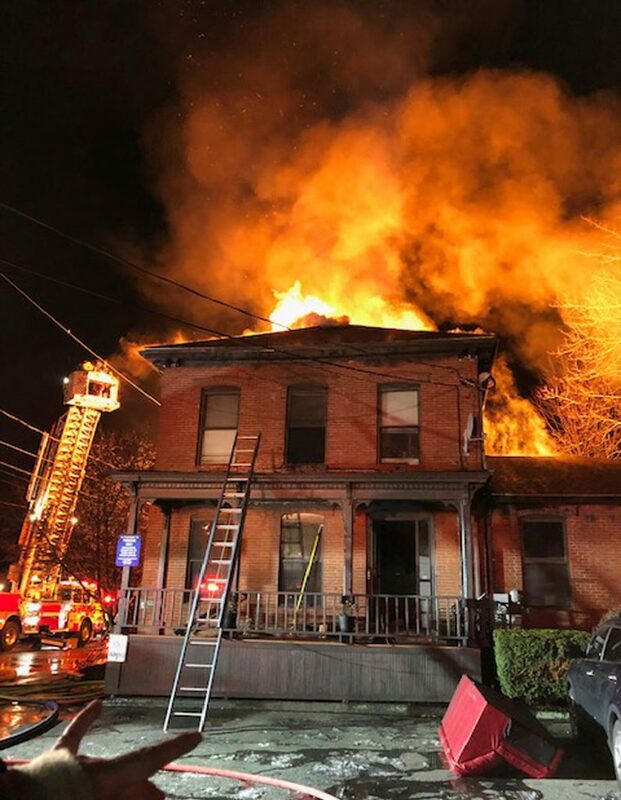 A fire Sunday night destroyed a downtown Westbrook building that housed a dentist’s office and an apartment, Fire Chief Andy Turcotte said. The fire at 13 Pleasant Street was reported shortly after 8 p.m., Turcotte said, and wasn’t brought fully under control until about 11 p.m. There were no injuries. Turcotte said Monday that the building, a two-story brick structure, was a total loss. The five people who lived in the top-floor apartment were displaced and are being assisted by the Red Cross in finding replacement housing. Turcotte said the cause of the fire is under investigation and Westbrook officials will be helped by investigators from the State Fire Marshal’s Office in attempting to determine the cause Monday. At one point, he said, there was a small explosion. The source is still undetermined, Turcotte said, but officials suspect that there were some bottled gases in the dentist’s office that ignited. A crew of firefighters remained at the scene overnight to make sure the fire didn’t start up again, Turcotte said.